Digital First Ventures, the venture-capital division of Digital First Media, has formed a strategic partnership with NewsCred, which specializes in digital content marketing and syndication. The deal will give Digital First’s MediaNews Group and 21st Century Media access to NewsCred’s technology, as well as allowing the partners to share content with each other. 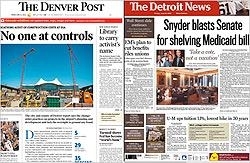 Digital First’s MediaNews Group owns a number of newspapers around the U.S., including The Denver Post, Oakland Tribune, San Jose Mercury News, Detroit News, St. Paul Pioneer Press and The Salt Lake Tribune. Newspaper publishers have been moving to forge new digital partnerships and introduce new digital products in recent months. Earlier this month, Advance Digital partnered with Echo to provide a digital infrastructure to encourage audience engagement and enable social sharing at its 12 local media properties, which include newspaper Web sites and local news sites, like OregonLive.com, Nola.com, and NJ.com. The new cloud-based capabilities will allow Advance publications to create real-time social experiences around online content, with features including live newsfeeds from reporters and readers, crowdsourced content and real-time discussions.